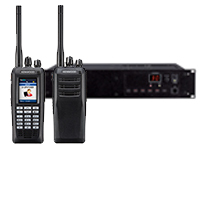 TDMA based DMR systems are ideally suited to low-complexity applications and where the user would like to continue to use their current 12.5kHz radio license; the DMR protocol doubles the channel capacity for 1 carrier when compared to analogue 12.5kHz operation. The 2 speech paths with 1 carrier operation also helps to reduce infrastructure costs per channel. TK-D200/D300 radios can operate in either analogue FM or digital mode. They are compatible with existing analogue FM systems, ensuring a smooth analogue-to-digital migration at the customers' own pace. Provides good visibility even under strong sun light or at night. Additionally, the display is recessed to reduce the risk of damage and scratches. “Mixed mode” operation provides automatic switching between analogue FM and digital calls. Ideal for a orderly migration from a legacy analogue system. The built-in GPS module supports positioning data transmission to other local resources. Non-GPS versions also available. The TK-D200/D300 provides a data capability to send text messages to designated individuals or groups securely and clearly. Compliant to MIL-STD-810 C/D/E/F/G (11 categories) & IP54/55. Allows users to identify channels and zones without looking at the display. These functions provide security and safety for users who work remotely as well as for those who work in potentially hazardous situations. When the radio does not move for a pre-set period, an alert signal is transmitted. When the radio moves excessively for a certain period, an alert signal is transmitted. Supports QT/DQT & 5-tone Encode / Decode, to facilitate gradual migration from analogue to digital with no need for extra and expensive option boards.